Servicescape is the biggest differentiator in healthcare experience. Traditionally, it is designed to satisfy the needs of healthcare provider in terms of performance and efficiency. Starting from patient’s experience and applying service design methods combined with interior architecture, design agency Diagonal has created innovative healthcare experience providing benefits for both staff and patients. 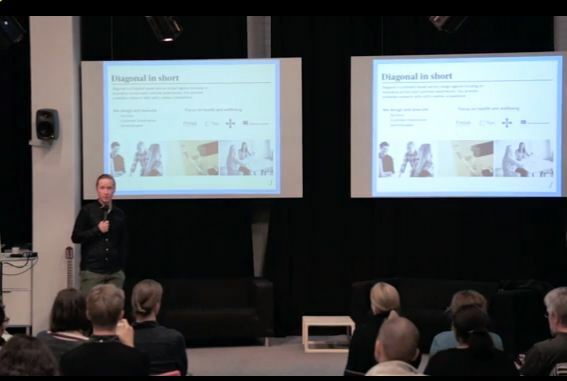 Juha Kronkvist from Diagonal has presented the project, as the fifth and final case in the competition for Service Design Achievement of the Year in Finland 2013 in Service Design Breakfast event at Startup Sauna on November 27th. Juha is one of the leading service designers in the field of health care and well-being. Three main components of healthcare design are performance, process and experience. As Juha explains, focus is usually on performance and process, while experience is often overlooked. What this case shows is that by studding experience, performance can be increased and processes made more efficient. According to Juha, one of the key starting points in service design is to find out how people assign the meaning and make sense of the environment. When those assigned meanings are aligned with organizational point of view, they should create positive customer experience. Servicescape is not only about physical things. It is about what those things communicate and what value they provide. Therefore, servicescape is critically influencing customer experience.